Mona Haydar knew that when she set up two signs outside a Cambridge library last week with the words “Ask a Muslim” and “Talk to a Muslim,” she had to be prepared for strong opinions about her faith. 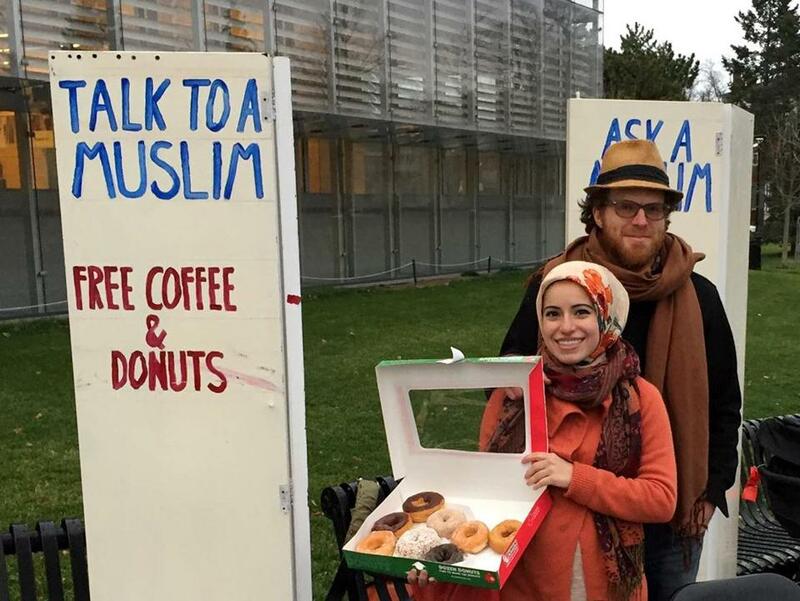 Holding a box of doughnuts and cartons of coffee from Dunkin’ Donuts, and wearing a traditional hijab, Haydar last Friday and Saturday planted herself alongside her husband, Sebastian Robins, outside the library for several hours each day. Haydar said that over the two days they spoke with more than 100 strangers. The initiative, she said, was inspired by a similar act, called Talk to an Iraqi, that was featured on “This American Life” in 2008. Some conversations revolved around her experiences as a Muslim woman growing up in the United States. Other discussions concerned Donald Trump’s recent comments about keeping Muslims out of the country. But mostly, she said, the interactions led to idle chatter. Those neighborly discussions are among her favorite things about spending time in a welcoming place like Cambridge. “People brought up the Red Sox, climate change, swimming — whatever,” she said. One woman who stopped to talk with Haydar and Robbins, who are both Muslim, was a student at Harvard Divinity School. Coincidentally, Haydar is applying to the school to pursue a graduate degree. Another woman stopped and talked about Chinese food. A man came by and they got to talking about dead languages. “There were some funny moments,” she said. But there were also tense ones. “I’m very visible, and people know I’m Muslim, and they’re curious of my experience. With other people it was heady conversation,” she said. Some people walked by briskly, avoiding eye contact. But Haydar said she understands that it’s the busy holiday season, and people have places to be, things to do. Cambridge City Councilor Nadeem Mazen, who is also Muslim, applauded the spontaneous “conversation starter,” calling the experiment a good way to dissolve people’s misguided perceptions about Islam. A Facebook post by Haydar, which included pictures of her two-day experience, has been shared more than 4,000 times, and has inspired others to want to try it. Haydar said she has received many uplifting e-mails from people who have been supportive of the project, and who asked for advice on how to set up a “booth” of their own. She said she and her husband plan to go back out again after the holidays, to give away doughnuts and talk with the community some more. “The world is a good and beautiful place with small pockets of hatred here and there. There is an overwhelming amount of love, and so remember this post when you are faced with bigotry and hatred towards you or your faith,” Haydar wrote last Friday.